Angela is setting the agenda for workplace design, domestically and internationally. Her designs are disrupting the nature of work, allowing people to work more creatively, productively, collaboratively and cohesively. Through design, she is influencing how modern businesses operate, work behaviours and how companies can tap into employees’ creativity and innovation. She is reinventing ‘work’. Futurespace works with some of the world’s top companies, including American Express, Microsoft, Qantas, and Google. In the past year alone, Futurespace has worked with PwC, EA Games, KPMG, REA Group, MYOB, Magellan and Astra Zeneca. Angela's work, together with her husbands - who is Director of Futurespace, can be described as inspiring, agile, technologically advanced, visually stunning, and aimed at increasing productivity, health and well-being that positively changes the way people work. As a woman in a male-dominated industry, Angela is creating pathways for other women to step up and achieve success. She is also focused on developing the next generation of workplace designers, helping them develop the skills and confidence to make it in a tough industry. As a leader in her industry, Angela regularly present on the topic of workspace design. She recently spoke at the 2016 Alberta Architect’s Conference in Canada, where she shared examples of how Futurespace is leading the world in how it is flipping the workplace on its head and totally disrupting the way employees work. As MD of Futurespace, Angela runs a mentoring program to educate and upskill the junior staff. This has been a huge success, and the engagement with employees is exceptional. Angela describes her design philosophy. Futurespace is disrupting the nature of work, allowing people to work more creatively, productively, collaboratively and cohesively. Angela shares with us the catalyst for the change in environment and design. Angela is influencing how modern businesses operate, work behaviours and how companies can tap into employee creativity and innovation. She shares her ideas and recommendations on how businesses can tap into employee creativity and innovation. Angela's work has been defined using the term 'alternative work strategies', and she shares her thoughts on this. Culture is a critical element for any business, and more companies are beginning to recognise and focus on culture as a performance enhancer – Angela shares with us how she is seeing workspace design impact and influence culture. Angela runs a mentoring program to educate and upskill the junior staff within Futurespace. She shares the impact this has had on the business. 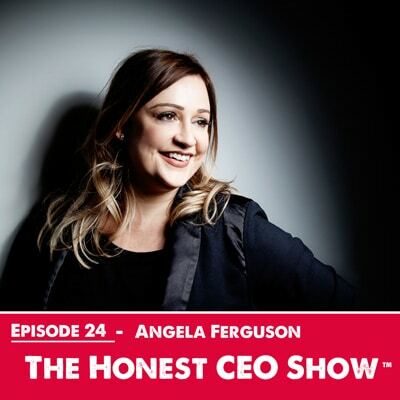 Angela opens up about the biggest lessons she has learnt in business. Angela shares her advice for anyone struggling in business. Angela opens us about what keeps her up at night. Sit back, listen, and I hope you take home one or two of Angela Fergusons's wonderful pearls of wisdom. If you are ready to Kick-Start 2017 & Make It Your Best Year Yet! The team at Virtual Executive are excited to help you achieve greatness. As an accomplished CEO and leader, our founder Caroline is thrilled to be able to share her advice with you, so you too can get remarkable results and success like she has. Are you Ready to CHOOSE to Design Your Life? Build a Thriving Business and live your REMARKABLE DREAM life, a Life that YOU LOVE!